Turn your old junk into cash – have a garage sale! 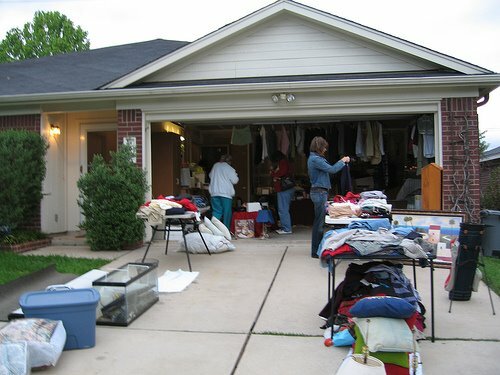 Last weekend, me, my wife and some friends held our very first garage sale. I mean I’d done loads of these before back in Adelaide with my parents, but it was my first time in Sydney. The event would have been much more successful had it not rained and rained and rained on the day! Only a few die-hard bargain hunters came by, but we still managed to take nearly $400, including some deals negotiated both before and after the event. Pick a date, and check the long term weather forecast. It won’t be 100% accurate (it said chance of showers on the date that I picked – ha!) Obviously it’s better during the summer months. Beware of traders – these are the people who try to get in early, snap up all of your best bargains, and then re-sell at the markets or elsewhere. They’re cut-throat, and will make every attempt to find out what you’ve got and get in there first, with fake stories about how they’re working on the weekend and can’t make it on the day but really desperately need a fridge, or else they show up at your door at some ungodly hour of the morning. Advertise! Your signs will get you a bit of traffic, but for maximum effectiveness, put an ad in the local paper, and make sure that it’s the one that gets read by more people of the type that would go to a garage sale. For instance, in Sydney you’d be better off with an ad in The Telegraph (the preferred rag of the working class) rather than the Sydney Morning Herald (too high brow). Make sure to specify the date, and the exact time when the garage sale will start, to prevent the scabs mentioned in the previous point. There are also some free classified Websites such as Gumtree which worked quite well for us. What are some of the things you’ll need to prepare? And finally, be prepared to haggle! There will be some hard bargainers, so make the decision in advance whether you’re going to play hard ball and live with the possibility that your stuff won’t sell, or be a pushover and get rid of all your stuff cheaply and quickly but live with the regret that you could have earned more. As for me, it looks like we’ll be having a re-do next weekend when the weather is more amenable. Look for us on Twitter! I’ll be using the same hashtag as the first one, #naidoomarkets.